From high on the German and Austrian border, we make our way down to Innsbruck, the historic capital of the Habsburgs. We slap-dance the night away in a nearby Tirolean village before turning to feudal Italy at Reifenstein Castle. Then we're out-of-doors, zooming up rock cliffs and hiking through alpine meadows in the Italian Dolomites. Gasthof Badl is a big, comfortable, friendly, riverside place with 26 rooms run by Sonja and her family, with help from Leo, their enormous, easygoing dog. I like its convenience (right off the expressway but a short and scenic walk from Hall's old town), peaceful setting, big breakfast, and warm welcome. Reifenstein Castle, with one of my favorite castle interiors in Europe, is just off the highway at the town of Sterzing/Vipiteno. While easy for drivers, it's not worth the trouble for those without wheels — it's unique and interesting but only open for a few non-English tours a day. The castle is privately owned and has not been developed for tourism (no gift shop, no café). Its layout and decor have changed little since the 15th century, when it passed into the hands of the Teutonic Knights. Since 1813, a branch of the noble Thurn and Taxis family has owned the castle. The current heads of the family (an elderly brother and sister) live in Innsbruck, and have chosen to keep the castle just as it was when they spent summer vacations here in the 1940s as children. On your tour, you'll see most of the building, including bedrooms with original wall paneling and decorations, a real dungeon, wooden boxes knights slept in, and a medieval kitchen with a roof that is black with centuries of soot. 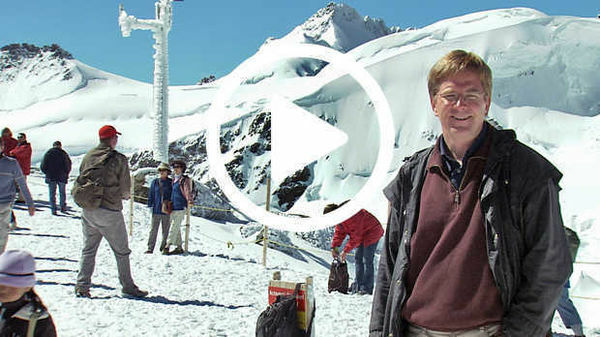 Hi, I'm Rick Steves. Thanks for joining us as we share some of my favorite European discoveries. We're starting atop the Zugspitze — the mightiest of German peaks, at 10,000 feet. The Zugspitze straddles two great nations. I'm in Germany…I'm in Austria! Descending the Austrian side of the Zugspitze, we'll see busy Innsbruck, but stay in small-town Tirol. After crossing the Alps, we'll tour my favorite medieval castle interior and make the town of Kastelruth our homebase for sampling Italy's rugged Dolomites mountains. In Western Europe, Germany, Austria and Italy come together high in the Alps. From the Zugspitze, we'll travel through Innsbruck and the Tirol in Austria before crossing the Brenner Pass into Italy. There, we'll make stops at Bolzano and Kastelruth. This cross marks the spot where climbers first reached the summit here in 1851. While this marks the highest point in Germany, we're heading into Austria where there are plenty of higher peaks. From here the Alps arc before us like a grand alpine symphony. At the Zugspitze summit, as on so many European mountain tops, you'll find restaurants, shops, and well-entertained tourists. The German side is scaled by cogwheel train and cable car from Garmisch, about an hour's ride to the north. This speedy tram is taking us down the Austrian side to the village of Ehrwald where we parked our car. The famous Zugspitze attracts travelers from around the world. Escaping the tourist crowds takes initiative and, to reach some places, a car. We're driving to Fallerschein, a tiny tumble of log cabins at the end of a road. Our goal? To catch a glimpse of Austria as it might have been a century ago. Fallerschein, at 4,000 feet, replaces the modern scramble with a flower speckled world of serene slopes and andante cowbells. Thunderstorms roll down the valley like it's God's bowling alley. And braced against the weather, the tiny hamlet continues to survive. Daily life and the village economy has revolved mostly around the cows. Originally this was a summer-time only community of dairy farmers. But today the village is also popular as a romantic retreat for Austrian vacationers who've rented cabins here. Fallerschein is famous among those in the know as a rustic get-away. Hikers and budget travelers bed down here in the Almwirtschaft Fallerschein. Above the mountain restaurant there's a loft filled with mattresses. This is a mattress loft — or "matratzenlager." Throughout the Alps, lager is a key word for cheap bed. The lager and restaurant are open May through October — weather permitting. After Fallerschein, Innsbruck — a couple hours' away by car — feels like a metropolis. Six hundred years ago, this popular tourist stop was the Habsburg capital of the Tirol. By the time they got here, the Habsburgs were well on their way to being Europe's most powerful family. They expanded and consolidated their vast power through clever alliances and politically helpful marriages. This much-ogled Golden Roof was built by Habsburg Emperor Maximilian in 1496. The roof with over 2500 gilded copper tiles remains the town's centerpiece. The Habsburgs ruled here until the end of World War I. Innsbruck's medieval center is now a pedestrian zone. Looking past the crowds, it still feels like an old provincial capital. The city's folk museum is a medieval Tirolean home show. Cribs were decorated with Christian themes to be sure God watched over the little baby — but just to cover all their spiritual bases, a pre-Christian Druid pentagram was carved on the headboard. And offering another kind of protection was this man, a "saltner" — or human scarecrow who guarded the vineyards from — boars, foxes and birds. This exhibit shows off the region's tradition of fine woodcarving. While this could be any Tirolean village, it's Bethlehem in the Alps. Bible stories like this Nativity scene made most sense to locals when presented in a familiar home town setting. One of Innsbruck's most famous sites is above the city — the ski jump. The spotlight of the world was on Innsbruck as it hosted the Winter Olympics twice, in 1964 and '76. Sports fans may recall many infamous crashes off this jump. For safer sport, hikers take to the surrounding mountains on foot. Innsbruck's worth a quick look. But I prefer a small town — one with fewer tourists. Tonight we're sleeping five miles down stream in the town of Hall. Before the time of the Habsburgs, Hall in Tirol was a rich salt-mining center and Innsbruck was — as its name implies — just a humble bridge town on the Inn River. So, Hall's medieval center is actually larger than Innsbruck's. Laid-back Hall cradles its market square. Hall's pastel buildings and cobbled streets feel refreshingly real. Too real if you're trying to accomplish anything more than a leisurely lunch from noon to 2:00 when everything closes. And in small town Europe, many restaurants take a weekday off. This sign says "heute ruhetag" — that's German for "today is our quiet day." During the rule of the Habsburgs, Hall's Castle served as the local mint. Five hundred years ago, this how you made money. Traditional methods are still used here to strike shiny souvenir coins. Back when salt was money, Hall was loaded. The town's elegant architecture and rich church make it clear that in its day, Hall was a local powerhouse. This much-appended Gothic church is decorated Baroque with fine altars, gilded starbursts, and the skulls and skeletons of saints, eerie relics that look back at you. The old pedestrian bridge leads over the Inn River, and to our hotel. In Europe, I rely on a good guidebook for hotel listings, make reservations by telephone a day or two in advance, and reconfirm with another phone call before showing up. Gasthof Badl is a friendly place run by Frau Steiner. It's convenient and offers a warm welcome. As in many hotels, tourist information brochures in English are readily available in the lobby. Frau Steiner is checking to see if there's a Tirolean folk evening nearby. Frau Steiner: Yes, everything will be fine for this evening. OK, so tonight in the village of Maurach we've got a folk evening. It starts at 21:00. Europe uses the 24-hour clock: So, anything over 12 subtract 12 and add p.m. 21 minus 12 — 9 pm. Alright, we have time for dinner and Frau Steiner is joining us. The cuisine of the Tirol is not to be missed. Guesthouses take pride in serving local specialties, such as spaetzle, roast pork, and sauerkraut. Rick: You must like dumplings. You ordered the dumpling extravaganza here. Frau Steiner: I love dumplings. It's a quick course in fine eating — "Dumplings 101." Rick: You don't want to tell us the secret of the best dumplings? Frau Steiner: I think I have to keep the secret of Tirol with the dumplings. Oh well, we'll have to take comfort in the apple strudel. Okay, onto some music! Tirolian Folk Evenings like most folk evenings might be touristy...but a rowdy dose of slap-dancing offers a lively glimpse of tradition. How did the custom start? Strutting your lederhosen and schnapps must be in there somewhere. Rather than a big city stage show, we've opted for a small town hotel evening. It's intimate, lively, and right in your lap. Slap dancing is a snappy cap to our folk evening in the Tirol. We'll be yodeling in our dreams. For a car-hikers' look at life in the high Alps, we're taking the toll road up to 5,000 foot high Hinterhornalm. Detailed maps show the tiniest of roads leading to the grandest of alpine perches. The mountains surrounding Hall and Innsbruck are a nature lover's wonderland offering countless mountain lifts, huts and a lifetime of trails. Whether you are car hiking, biking, rock-climbing or parasailing these Alps demand only as much exercise as you feel like giving. From the parking lot at the end of the road, it's a level 20 minute stroll to the Walderalm farm. This is actually a cluster of three family-run dairy farms sharing their meadow with the clouds. Seventy cows enjoy ridge-top rambles surrounded by cut-glass peaks. Today, happy hikers can sample wild mushroom soup for lunch, and milk doesn't get any fresher. The Brenner Pass has been the easiest way over the Alps since Roman times. Nearly 2,000 years ago, Roman legions followed this route — the Via Claudia — on their way north to conquer much of Europe. Well grooved sections of the original road are still preserved. Today, the Brenner Pass is easier than ever to cross as drivers arc gracefully along one of the engineering wonders of Europe. From the top the Europabrücke, or Europe's Bridge, feels like a freeway, but from the windy old road at the valley floor it looks like a mighty sculpture. The freeway zips drivers from Innsbruck to the Italian border — in about 30 minutes. How about pasta for lunch? These days crossing borders in Europe is a wave through. The Automobile Club at the border is worth a stop. Rick: Okay, we like to go to Sella Pass. What is the best way? While the Autobahn in Austria and Germany is toll-free, the Italian Autostrada has plenty of toll booths. But that's nothing new there. For thousands of years, travelers have had to pay to cross Brenner Pass. Since Roman times this strategic valley has been lined with forts — ancient toll booths. In the Middle Ages this was the German trade route to Venice and Florence. When medieval traders reached this valley, chances are they stopped, willingly or not, at a castle like this. Reifenstein Castle has grown more welcoming with age. While it used to take a battering ram to get these doors open, now all it takes is a few Euros. Reifenstein offers one of Europe's most intimate looks at medieval castle life. The actual countess of Reifenstein still lives in her private and rustically elegant castle quarters. Her aide, Frau Plank, shows visitors around several times a day. We called this morning to confirm our 10:00 tour. Frau Plank gives the tour in both German and Italian and she squeezes in what English she can. She let me try an ingenious gadget for a tipsy lord. Too much to drink? A clever funnel guides the key right into the hole. From the looks of the sumptuous green room, medieval life here was pretty comfortable. Some of the original painted wall decorations survive. You can catch a view across the valley to Reifenstein's sister castle. Two castles straddling the valley could control much of the trade passing between Germany and Italy. But to exercise his power and collect those tolls, the castle lord needed a small personal army. This room is the knights' quarters. Six to eight fighting men shared each of these boxes — complete with hay for maximum comfort. Imagine 40 snoring knights packed into one room. And every good castle needs a dungeon, used mostly to enforce taxation. If you couldn't pay your taxes you'd spend eight days down here — no food but a little water. Enough taxes, dungeons and duties, we've escaped and we're on our way to a relaxing Italian town south of the Brenner Pass. Bolzano is the leading city in the Italian Tirol. Except for the sunshine, it feels more like Innsbruck than Italy. The arcaded main street stretches through the medieval heart of town to Piazza Erbe with its ancient and still thriving open-air produce market. In Bolzano, everything you'll need is within a short walk of the train station. Rick: Kann ich 500 Gramm Aprikosen? This enjoyable old town of 100,000 is the most convenient gateway to the Dolomites. The Great Dolomite Road leads to the nearly 7,000 foot high Sella Pass. The Dolomites are Italy's dramatic limestone rooftop. They offer some of the best alpine thrills in Europe whether you want to stay firmly planted on the ground or soar high above the valley floor. The bold limestone pillars offer something for everybody. This is rock climbing country — thrilling, even for spectators. The Val di Fassa ski country is busy with hikers in the summer. The many lifts do the climbing fast and easy, depositing sweat free hikers at thin air trail heads. Your entertainment: views of the mightiest of the Dolomites. These gondolas are filled with skiers from December through April. Springtime — that's dead time in the Dolomites. The lifts are shutdown, huts are closed and the most exciting trails are covered in snow. We're here in late summer, and everything's wide open. Hiking season is mid-June through September. Kastelruth feels like an alpine village rather than a ski resort. I feature it in my Italy guidebook as the ideal homebase for exploring the Dolomites. The hyper-active belltower seems to sing the wisdom of honoring local traditions, like woodcarving. For centuries, farmers around here have passed winter months carving. Today their descendants—many with international acclaim—carry on the tradition. Erich Perathoner decided by age six he wanted to be a wood carver. He was inspired by the life-size sculptures towering over him at Sunday mass. Training under his father and grandfather, he learned the trade well and developed a passion for religious themes. Now, much of his work is done for the Church. Many European villages find their young people fleeing to big cities to join the modern parade. But Kastleruth's young generation knows they've got a good thing going right here, and they're staying. We happened on to Kastleruth's Bobbenfest, or boys' festival. On this special Sunday, everyone turns out to celebrate the town's young bachelors — dressed up peacock-proud in their Tirolean finery. A traditional rite of passage, this celebration includes an elaborate Sunday Mass. Later, the village gathers for a grand picnic. I asked, "Where are the girls?" "Don't worry," I was told. "The parents are taking careful notes." A hard-fought history has left the region bi-cultural and bi-lingual. Here in south Tirol locals speak German before Italian. Over the centuries the region has flip-flopped its cultural orientation. After the Roman Empire fell, the region's allegiance turned to the north. Later, it was firmly in Austria's Habsburg realm. But by losing WWI, Austria lost this land. Austria's South Tirol became Italy's Alto Adige. Mussolini did what he could to Italianize the region, including giving each town an Italian name. Kastleruth became Castlerotto. To win the region's favor, the Italian government has wooed locals with economic breaks. These have made it one of Italy's prosperous and expensive areas. Today, whether you prefer to call the region Alto Adige or Süd Tirol, all signs and literature are in both Italian and German. From Kastleruth we're heading up to Alpe di Siusi. Visitors ride a free park shuttle bus to Europe's largest high alpine meadow — a natural preserve at the foot of the Sasso peaks. The bus takes you to the trail head of your choice. The meadow is 3 miles by 7 miles wide and seems to float at 6,000 feet. It's dotted by farm huts and wild flowers, surrounded by dramatic Dolomite peaks, and crisscrossed by meadow trails — ideal for flower lovers, walkers, and equestrians. The Sasso Lungo mountains standing at the head of the meadow provide more demanding hikes, and a storybook Dolomite backdrop. Meanwhile, the spooky Schlern — home of mythical witches — looks boldly into the haze of the Italian peninsula. Not surprisingly, the Schlern, standing like a devilish winged victory, gave superstitious people the willies. But today, the Schlern witch is welcome in the villages, surviving only as folk art. She's become a kitchen witch — an amusing souvenir riding her broomstick into the hearts of travelers. 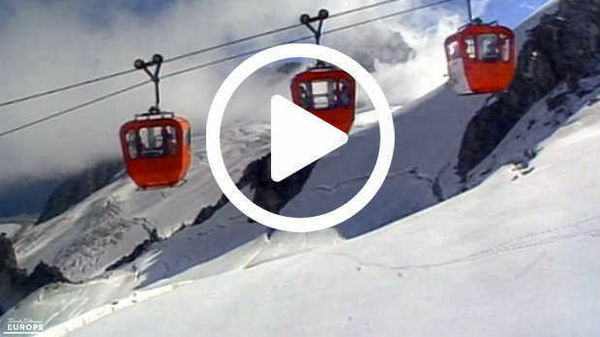 And chairlifts — not broomsticks — provide springboards for more Alpine thrills. Thanks for traveling with us. Join us next time for more travels in Europe. I'm Rick Steves, wishing you happy travels. Ciao.